Max. Power: 35 hp / 120 lbs. I designed and built the original Dillon EZ Tunnel in the summer of 2011 with the specific intent of introducing a simpler tunnelboat construction method aimed at the first-time builder, or anyone with a limited set of tools. 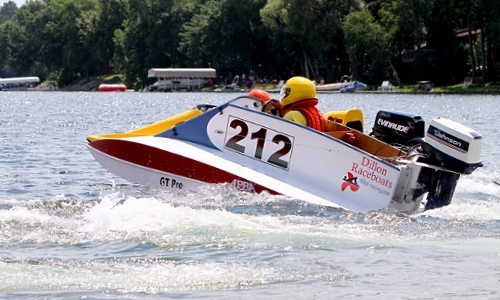 In the early autumn of 2011, after only a few test runs, I brought the new boat to the races in Forest Lake, MN. There were still some issues to iron out, but the boat proved very fast and finished third in its first GT Pro race, and second place in its second race. Back at the shop, I made a small change in the bottom that vastly improved the EZ Tunnel's turning ability. I only was able to drive the boat in three races in 2012. It showed excellent speed on the straightaways, but was still a bit limited in the turns. However, the EZ was designed more for its ease of contruction and speed down the lake than for its racing ability. To design the EZ Tunnel, I eliminated all unnecessary angles and curves, and replaced the usual long stringers with plywood bulkheads and girders. 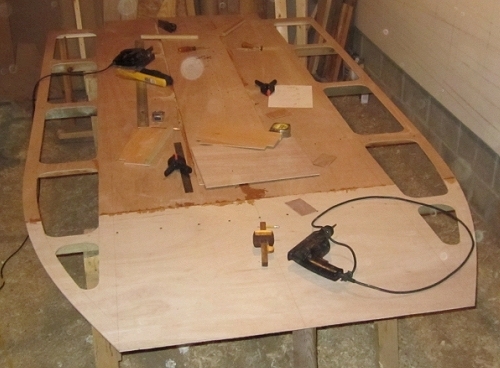 These parts are laid out right on the plywood sheets and cut out simply with a jigsaw. Study the construction notes to see how the process works. The Dillon EZ Tunnel boat was designed for the 31.8 cubic inch Johnson or Evinrude outboard motor. This two-stroke, two-cylinder motor was manufactured in 20, 25, 30 and 35 horsepower versions from 1976 through 2005. It is the 30 and 35 horsepower models (they are, in fact, identical) that we use in GT Pro. More about GT Pro HERE. Of course, the EZ Tunnel would also make a fun and exciting boat for the non-racing high performance enthusiast. A wide variety of motors would be suitable, including the 25/30 hp Tohatsu which is used very successfully for racing in Europe and Australia. A smaller motor (15-20hp) with a light-weight driver should also work very well. 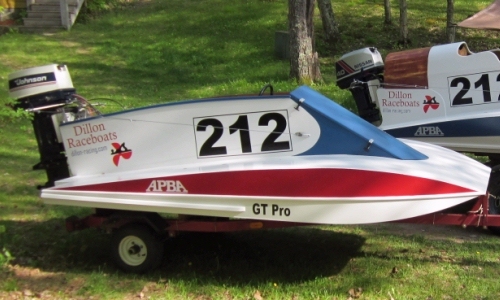 Whatever your non-racing purposes, I must state strongly that this boat is entirely unsuited for any engine that exceeds a weight of 120 lbs. As already stated, the EZ Tunnel is simple to build (as boats go), by design. A few basic tools like a jigsaw, electric drill, and a belt sander will perform most of the tasks at hand. Add to that a bit of patience and attention to detail, and you will have a boat that will not only go fast, but that you will be proud to own. I built mine entirely from 5mm, exterior-grade plywood and pine lumber for a finished, un-rigged cost of about $300. Racing the EZ Tunnel in Crosby, MN. Note how well she flies on her first pass by the camera. 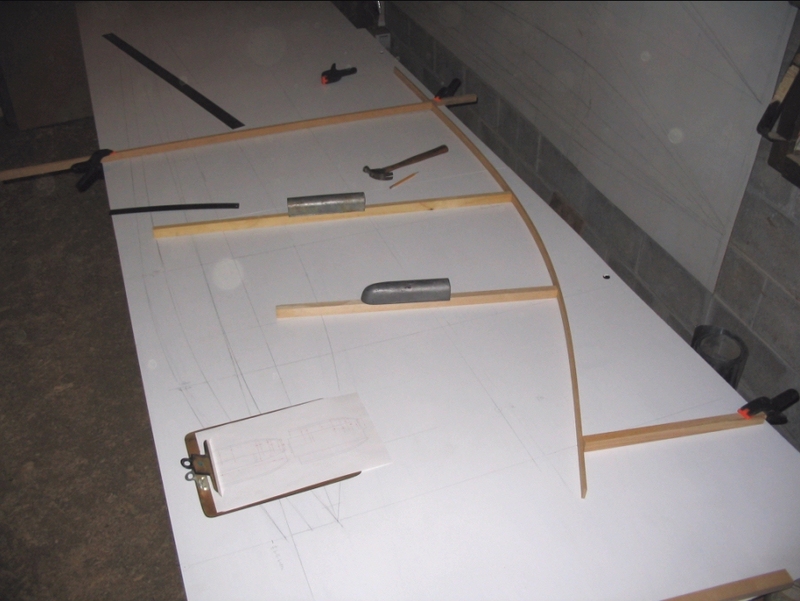 The plans package, available via direct download or by postal mail, includes eighteen measured drawings; a scantling list; and some notes on wood, hardware and other materials needed to complete your boat and set it up for recreational boating or sanctioned racing. Also, I provide extensive online construction notes, including dozens of photos, which will guide you through the entire building process. And, I will be just an email away if you have questions.